Description: When the long-running (1973-1986) #991 Play Family Circus Train had run it's course, the train engine, flat car, and caboose were modified for the Little People Express Train. 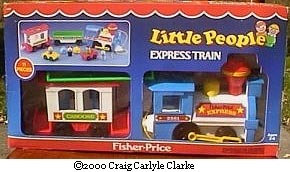 The Express Train set includes an engine, flat car, and caboose, two vehicles (cars), 2 pieces of luggage, and 4 Little People figures, including an engineer, mom, dad, and a dog. The only pieces that are exclusive to this set, besides the train itself, and that are somewhat hard-to-find are the two vehicles which were omitted in 1990. FPT695 - White express train engine with a blue cab and front. The engine has a white boiler and cowcatcher with a red litho on the sides of the boiler marked "Fisher-Price Express", a red smoke stack and a yellow button that makes a "choo-choo" noise when pressed. FPT709 - Green top, white base rectangular flat train car with a litho on the side marked "Freight". FPT710 - White caboose with a red roof, base, and red steps on the ends. The caboose has a blue door on each end, and a litho on the sides marked "Caboose". FPT8473 - Solid yellow one-seat car with a luggage rack behind the driver's seat. Rolls on 4 black wheels with metal axles. Wheels do not say "FP". The hood has a "F" & "P" imprint within circle on the hood. *This car was omitted in 1990. FPT624 - Red top, red base 2-seat car (front-to-back seats) with slightly raised "fins" on both sides of the back seat. The car has a gas hole on the back corner, a tow hook hole under the front bumper, and is marked "©1969-1987 FISHER-PRICE" on the bottom of the car. The car rolls on 4 black smooth rolling wheels with metal axles. The wheels NOT marked "Fisher-Price Toys". *This car was omitted in 1990. *See "Variations" below. FPT302 - Light Blue round "hatbox" style suitcase. FPT304 - rectangular yellow luggage. 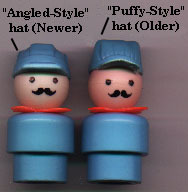 VPP - Short light blue train engineer with a moustache, wearing a red scarf, and an "angled-style" light blue engineer's hat. *See "Variations" below. CJPP - Green body dad with black molded plastic hair. FNPP - Blue body mom with fancy eyes and a blonde ponytail. HWPP - Black body dog with a red collar. The collar has lines on the outside edges. *Omitted in 1990. FPT625 - Red top, red base 2-seat car (front-to-back seats) with slightly raised "fins" on both sides of the back seat. The car has a gas hole on the back corner, a tow hook hole under the front bumper, and is marked "fp" and "FISHER-PRICE TOYS®" on the bottom of the car. The car rolls on 4 black smooth rolling wheels with metal axles. The wheels NOT marked "Fisher-Price Toys". *This car was omitted in 1990. WPP - The engineer could also be tall opposed to short. In 1990 both cars and the dog were omitted. This set was sold in a 18-1/8" long, 9-13/16" high, 3-11/16" deep display box.